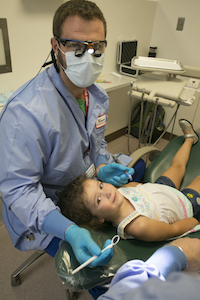 June 2018 – On August 28, 2018, Stony Brook School of Dental Medicine will provide free dental screening, cleanings, fluoride treatment and oral health education to hundreds of underserved children at their annual Give Kids A Smile® event. Sponsored by the ADA, Give Kids A Smile events are part of a national campaign to provide dental care and promote the importance of oral health to children who might not have ready access due to their economic status. Many families on Long Island do not have adequate dental insurance or the means to provide for proper preventive care for their children. According to the ADA, each year about 350,000 to 400,000 children are treated at more than 1,500 locations across the nation during Give Kids A Smile events. Stony Brook School of Dental Medicine has participated in the program since its inception in 2002. The August 28th event will be held between the hours of 2:00 PM and 6:00 PM at Stony Brook School of Dental Medicine's Dental Care Center and is open to children between the ages of one to seventeen. To schedule an appointment or obtain more information, please call Stony Brook School of Dental Medicine at (631) 632-8889 or (631) 632-8967 between the hours of 9:00 AM and 5:00 PM. Walk-ins will be accepted if time permits. Each child must be accompanied by a parent or legal guardian. Please note: this is a one-time event and will not establish any child as a patient of record at Stony Brook School of Dental Medicine's Dental Care Center. Take LIE east to exit 62 N, Nicolls Road (approximately 8 miles). Cross over Rte 347. The 2nd light is Stony Brook's entrance. Make a left at the South Entrance (West Campus) and go around the curve. The parking lot for the Dental Care Center is on the right. Enter main doors and follow signs for Give Kids A Smile registration desk. For Google Maps, enter "Stony Brook School of Dental Medicine South Drive".